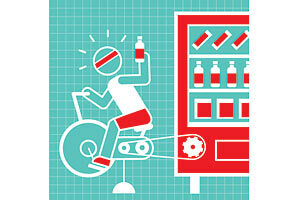 When it comes to building a healthier vending machine, lesser minds have considered only swapping out the sodas and Snickers for apples and granola bars. But Pep Torres has a better idea. At his Barcelona workshop, Stereo-Noise, he attached a stationary bicycle to a vending machine so a customer who wants a product would have to pedal a certain distance to get it. Thus far, Stereo-Noise has had just one taker  a Spanish baked-goods company  but Torres has high hopes for the device. "We'd like to see it in subway stations and schools," he says. "That way, people can eat their potato chips and still get in shape."